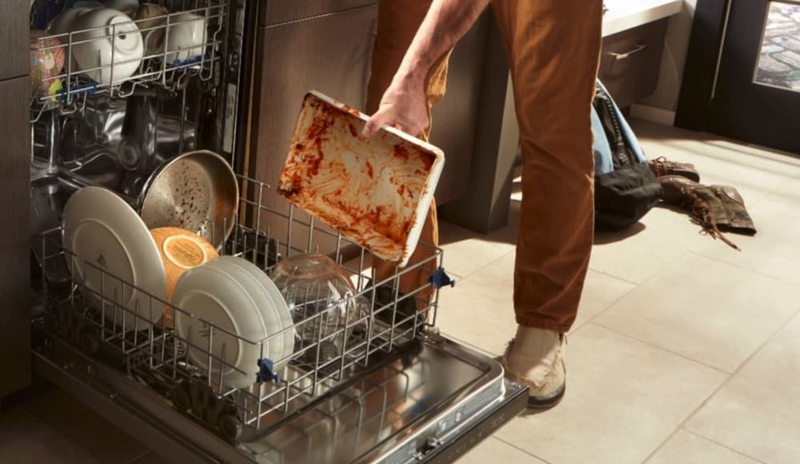 For those of us who consider a good dishwasher to be one that can rinse, wash and dry our dishes, the wide range of prices we see from popular brands can be confusing. After all, can there really be that much of a difference between a $2,000 dishwasher and a $400 dishwasher? And while the truth is that high-end brands like Bosch and Miele truly do create superior products, there’s one brand that is delivering high-quality machines at a consistently reasonable price point. Whirlpool dishwashers are dependably long-lasting, efficient and quality products. In this article, we’ll take a look at some of the main features of Whirlpool dishwashers and examine their four most popular products currently available on the market. What makes Whirlpool dishwashers distinct? First, let’s take a look at what makes Whirlpool machines distinct. While this Whirlpool feature might be a mouthful to say, it is a truly distinctive feature of the brand. It’s designed to cover the entire interior tub with a high-pressure spray via 21 nozzles to ensure that every dish is properly rinsed and cleaned. That can be difficult for many manufacturers, particularly when you consider that the average dishwasher is loaded randomly. Whirlpool products which prominently feature the TotalCoverage Spray Arm include:WDTA50SAHZ, WDT750SAHZ and WDTA75SAHZ. When you go with Whirlpool, whether you get a plastic tub or stainless steel tub will depend on your price range. All Whirlpool models under $500 feature plastic tubs, but many of the higher-end models do boast stainless steel tubs. Although, plastic tubs are not attractive looking, they help keep costs down for Whirlpool. In addition, since Whirlpool uses a heating element for drying, a stainless tub is not an essential need (Stainless tubs -at least stainless steel interior walls- are required for dishwashers that do not have a bottom heating element. The reason is the tub serves as an integral part of the drying system). In addition, stainless tubs tend to absorb noise better and they do not discolor over time. The same set of products we mentioned above feature a stainless steel tub. WDTA50SAHZ, WDT750SAHZ and WDTA75SAHZ. Fan Dry Option speeds up the drying process as it efficiently circulates the hot air inside the tub. The only Whirlpool machine that features this option is the WDT730PAHZ. As dishwashers have become more energy- and water-efficient, cycle times have become longer. However, Whirlpool dishwashers all feature a one-hour cycle option that speeds up dishwashing time. Sure, you won’t be doing the environment any favors, but if you need your dishes done before that big dinner party tonight then the environment will forgive you. Soil Sensor is a feature shared by all Whirlpool dishwashers. Sensor determines how dirty the dishes are and adjusts cycle time and water use. Great for energy savings and for those of us who only use one button on the dishwasher (no need to play around with the menu to customize options). Sensor Cycle is closely related the the soil sensor and expands on its capabilities. Saves water and energy. Determines load size, the temperature of the wash. All models have this feature except for Whirlpool WDF520PADM. Most Whirlpool dishwashers feature enough cycles and unique options to serve most households effectively. These include the Sani Rinse, which removes 99.99% of bacteria, plus the Heated Dry which gets great drying results from plastics which can often be tough to dry in a dishwasher. You can even use Hi-Temp when cleaning baby bottles for an extremely sanitary clean. Newer Whirlpool models feature Wi-Fi connectivity and smart features. As of today, only the WDTA75SAHZ in Stainless Steel and WDTA75SAHZN in Sunset Bronze have the “smarts” when it comes to connectivity. But as home automation continues to grow in popularity, we expect the amount of models with these features to increase. So what’s included in these smart features on Whirlpool machines? Control Lock Mode is an option that allows you to remotely lock your control panel, keeping children from turning the dishwasher and dishes inside into a playset. You can even download 'Specialty Cycles' from your phone app, which is useful if you want even more customizable cycles and options that those that come standard on your machine. If you need to clean your filter, the Whirlpool app will alert you. You can even find troubleshooting and support information that can help extend the lifetime of your machine. And if your dishwasher is in need of service, Whirlpool can automatically send information to its service database and help you set up an appointment for maintenance. Amazon Replenishment will automatically order detergent refills when it needs them as you focus on the other tasks you have to finish. Whirlpool models with smart features also boast integration with Alexa Assistant, Google Home and Nest. WDT730PAHZ Listed at $599, this dishwasher offers all of Whirlpool’s standard features. While its 51dB noise rating is not considered quiet and the plastic tub certainly isn’t as luxurious as the stainless steel, it does feature the Fan Dry option and an effective heating element. The smooth front surface is made from fingerprint resistant stainless steel. WDF520PADM Listed at an affordable price of $499, this model holds 14 place settings—less roomy than most competitors. It’s also fairly noisy at 55dB. WDTA50SAHZ This $699 model boasts added features like the TotalCoverage Spray Arm and modern stainless steel tub. The 47 dB quietness level is solid for this price point. If you’re looking for a towel bar design, consider this model’s cousin, the WDT750SAHZ. WDTA75SAHZ It’s $799, but this is the latest outing from Whirlpool and features modern design upgrades to match. These include smart connectivity, making this a fun dishwasher to use (if such a thing exists). You’ll also enjoy the quiet 47 dB operating noise. If you’re looking for a similar model with a contemporary handle, consider the WDT975SAHZ. Whirlpool dishwashers may be budget-friendly, but they’re also reliable and dependable. If you want consistently satisfactory clean on the lower-end models, we recommend using the Pots and Pans cycle even for regular loads. Overall, if you’re willing to spend over $500, you’re sure to get a fairly reliable Whirlpool dishwasher for you and your home. What does Whirlpool mean by "Heavy duty" dishwasher? Basically, they mean that you would never want to use this dishwasher in a home smaller than the size of an airplane hangar. These things are loud. At 65dB, they’re louder than a small truck. Avoid these if possible. Quite frankly we are surprised to see so many 1970's looking, low-end models in the Whirlpool catalog. Does Whirlpool make 18" dishwashers? Yes! Here’s a list of all 18” Whirlpool dishwashers. Does Whirlpool make panel ready units? Yes, here is the list of all panel-ready Whirlpool dishwashers.